Purple is not a popular choice of color for a dining room and that’s what makes it an interesting choice when it comes to the theme color for your dining space. 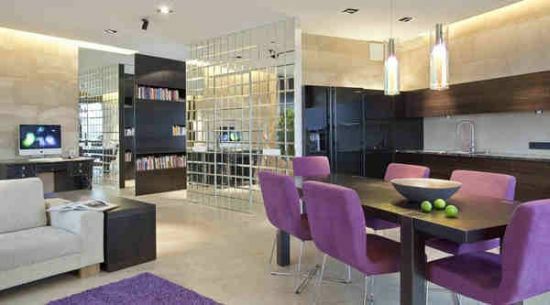 Deep purple may be a bit tricky to work with since it can make your dining room feel gloomy and heavy. However, it adds warmth to your dining space. Lighter shades are great as well especially if you add other colors or elements to it. 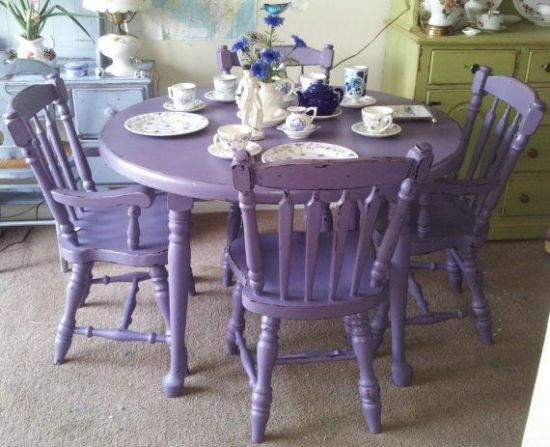 So explore your eclectic side by welcoming the different shades of purple into your dining room. 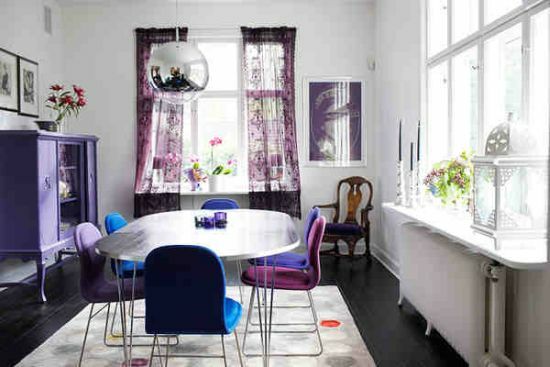 Here are 20 eclectic purple dining room ideas to try in your own dining space. There is something about a rustic theme that a lot of people love which makes it a popular choice of home interior design, whether it is for a living room, bedroom and dining room. The dark colored wooden furniture in this purple dining room has helped to give a warmth and cozy feel in the dining space. The beautiful chandelier that’s hanging right above has also made the room to look even more elegant. Having a touch of pattern on the wall can help to brighten up your dining room. Stick to a strong palette of purple and then play with other colors, such as gold, in order to keep your dining space from looking dull. The dark wooden chair and the Classic style chandelier complements well with the purple colored wall and the purple carpet. You can also have some candelabras as a centerpiece. This is one of the dining room ideas for those who want a touch of glam in their dining room space. Sometimes, it feels great to dine or perhaps, have breakfast in one corner of your home with the sun breaking through your beautiful French glass doors, just like with the picture below. This Purple Dining Room is one of the most stunning dining room designs to incorporate in the corner of your home. The gorgeous looking purple tufted chairs look truly elegant alongside the white French doors which help to enhance the overall look of your home. The rectangular glass dining table with white paneling and the box like white chairs look fantastic in this purple walled dining room. The golden mirror on the wall and the beautiful glass chandelier on the ceiling has made this dining space to look even more sophisticated and glamorous. The massive bay windows on the side allow natural light to get in and thus, this dining space is also a perfect place to start your day with a hearty breakfast. If you want to surround your dining room with natural views, then take inspiration from this nature inspired dining room. Here, the glass windows and doors open up to the beautiful views of green trees on the outside. To repeat the beauty of nature on the inside, decorate your dining room with plants and other nature inspired dining room décor. And in order not to block the view from your dining space and to allow some sunshine during daytime, install white sheer curtains on your windows. If you have a modern designed home and you want to follow the same thing for your dining room, then all you will do is to make use of modern designed table and chairs. As you see, this purple dining room features metal framed purple chairs that perfectly complements with the rectangular white wooden table. A beautiful chandelier can certainly help to make any room to look elegant. Thus, most of the elegant dining room ideas would often include an elegant chandelier hanging right above the dining table. When choosing the chandelier to install, make sure that it is something that will match with some elements in your dining room as well. 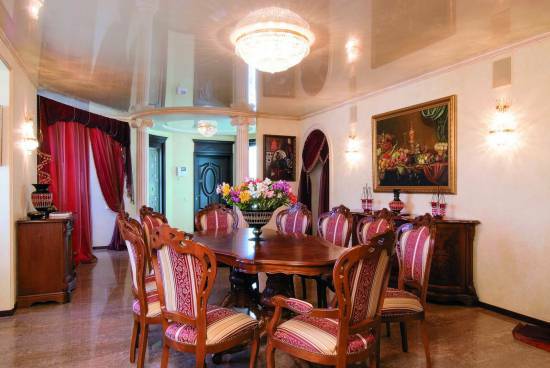 In this dining room, the cream colored chandelier perfectly matches with the walls and the carpet as well. Mismatched chairs certainly add character to a dining room space. 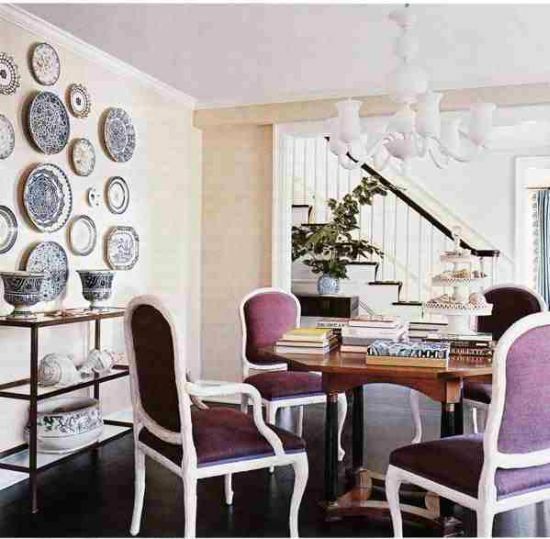 In this dining room design, the oval shaped dining table is surrounded with chairs in different colors, although it’s easy to tell that the primary theme is purple by just looking at the purple shabby chic cabinet on the side.. Take note however that if you mix and match different colors of dining chairs, they should be of similar style and shape. This is one of the dining room designs to follow if you want a shabby chic dining space. If you really love the purple color for your dining room, then go for it. But think of another color to offset the purple shade, and in this case, it’s white. 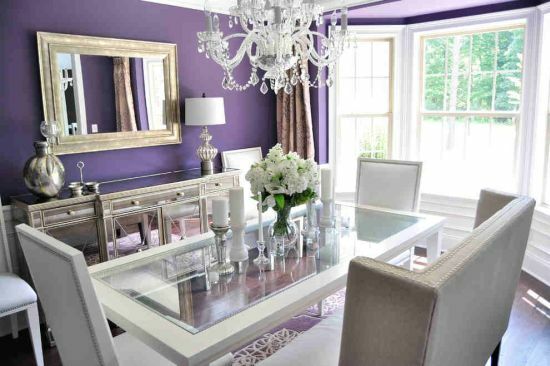 The white accents in this purple dining room help to add glamor to the overall look. 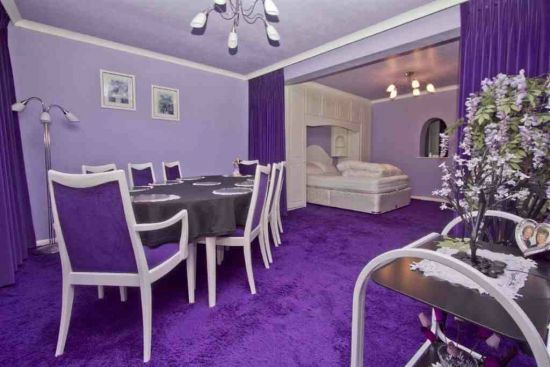 You can start by painting the wall in purple and installing purple carpet on the floor. After that, invest on purple furniture pieces that come with white borders, such as these beautiful chairs. 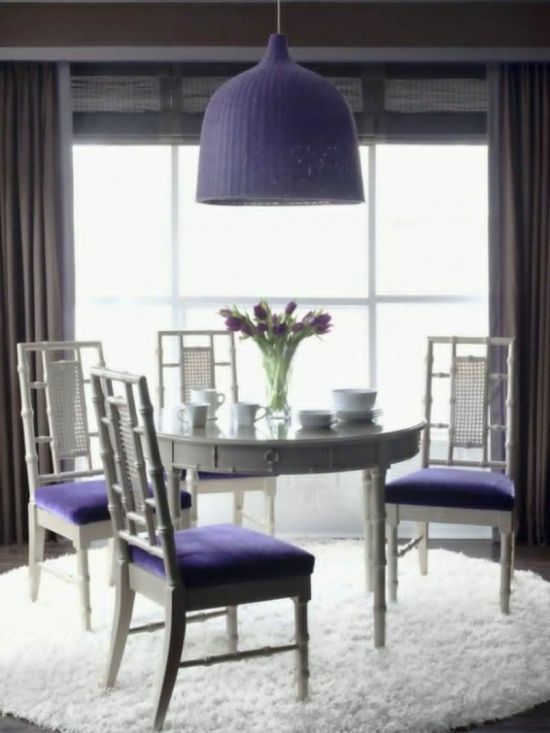 A white chandelier will also make a perfect dining room décor for this purple themed dining room. 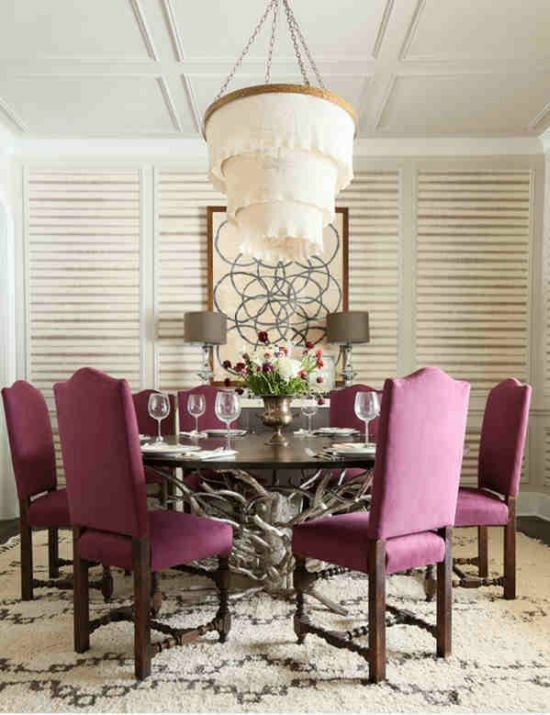 Designing a purple dining room will often start with decorating it with purple hued furniture. When it comes to your dining chairs, you can stick to a strong palette of purple but feel free to play with patterns so as not to make your dining room to look dull and boring. You can have soft floral prints on your dining room chairs, similar to the one shown below. As you can see, the chairs look very feminine and pretty. Take note however that overdosing it can make your dining room to look tacky, so always keep everything well balanced. If you want to infuse an artistic flair into your dining room, then this would be a perfect design inspiration. As you can see, the purple walls are adorned with some creative art pieces along with some beautiful lighting. The white borders on the wall perfectly complement with the beautiful dining table and chairs. These dining room ideas are recommended for small dining room spaces, such as apartments and condominiums. A Classic designed dining room is all about decorating traditional and antique pieces on the walls. As for the furniture, these purple Louis style chairs would be perfect. In order not to make your dining room space look a bit intimidating, keep everything in neutrals. You can have the wall painted in creams or white. Hanging a Classic style chandelier on the ceiling will also be perfect. Bright and airy dining room designs are all about having clean walls and airy window treatments. Take inspiration from this small dining room. The white washed table with white wooden chairs and the white carpet look perfect for this light filled room with a view. In order to keep the entire look grounded, add just the right amount of color to it, such as the purple upholstery on the chair and the stylish purple lighting. If you want a rustic theme for your dining room with a modern twist, then this modern rustic purple dining room is a great inspiration. Here, some of the furniture and fixtures are modern, yet the wooden dining table is evidently rustic. With this design, make sure to lean on accents and textured pieces in order to soften up your dining space. The set of purple chairs help to keep the dark colored wooden table from feeling too bleak. Stripes are a great choice of pattern if you want to add character to your dining room wall. With the use of some painter’s tape and with a steady hand, you can easily come up with a striped pattern on your purple wall. You can also inject some colors to it, just like with what’s shown in this picture. As for the furniture, make sure to stick with a solid color. A wooden table with white chairs would be perfect. If you want a dining room that is reminiscent to the Victorian era, then decorate your dining room with Victorian inspired dining room furniture. A Victorian design is known for its orderliness and ornamentation. This dining room features purple chairs and table with gold accents that makes it to look even more elegant, which is what a Victorian dining room should be. The sophisticated chandelier and the beautiful candelabra are the perfect dining room décor for this dining space. Those who want a cottage style or a shabby chic feel for their dining space, this rustic purple table and chairs would be a great idea. As you know, shabby chic design is all about using custom made furniture pieces so this beautiful purple wooden dining furniture would be a great choice of furniture. You can also install other shabby chic furniture, such as a distressed cabinet in pastel color. 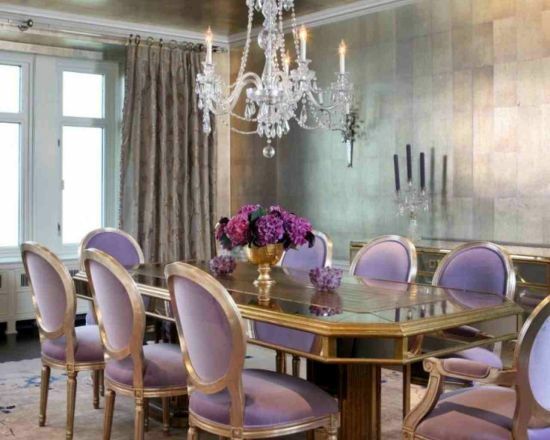 Gold and purple are a great combination of color for your dining room design. Thus, if you are thinking of another color to offset the purple shade for your dining room, then gold will be a perfect choice. All you actually need is to install gold colored accessories such as the huge golden mirror on the wall and the golden chandelier. White represents cleanliness so it’s no wonder why a lot of people would love to keep their dining room in white. But keeping everything in plain white color could make your dining space look boring. Therefore, infuse some color to it and a great choice would be purple. Just take a look at this white dining room. It looks so clean and neat, yet it’s not that dull because of the purple accents. The purple carpet will make a great choice of dining room décor since it does not get dirty easily. If you feel that you do not need a formal dining room for the entire year, then you can come up with a small dining room in one corner of your house. This modern small purple dining room is great for an intimate Thanksgiving dinner with your partner and cozy enough to accommodate two more guests. This is also a great place to spend your Sunday afternoon sipping tea and if you want to allow some light to get in during daytime, simply open your purple curtain. 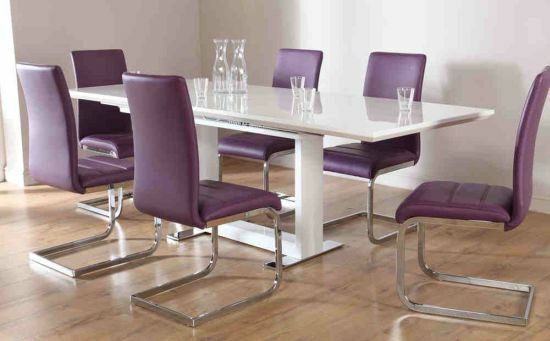 A small round dining table will also look great with these modern designed purple chairs. There are absolutely a lot of exciting designs that you can introduce for your purple themed dining room. Hopefully, these purple dining room ideas can help to give you an inspiration for your dining room makeover. These designs will certainly make your dining space look attractive, giving it a welcoming ambiance allowing you to entertain guests at anytime of the day, especially during the holidays.